The Lada 2107, one of three so-called classic models, was first introduced in 1982, when Leonid Brezhnev was in power. It starts at $7,300, less than half the price of the Ford Focus and VW Polo. MOSCOW -- Lada, the car of the Soviet proletariat, survived the transition to capitalism and is now expanding to fend off Volkswagen AG and General Motors Co. two decades after the collapse of communism. Lada's parent OAO AvtoVAZ, which is 25 percent-owned by Renault SA, plans to invest about 153 billion rubles ($5.4 billion) to introduce seven models in the next three years. The cars will in some cases replace vehicles that were developed before Mikhail Gorbachev came to power in 1985 and presided over the collapse of the Soviet Union. Lada, Russia's dominant brand with a 24 percent market share, is under pressure to defend that position. GM, VW and Ford Motor Co. are pushing into the market, which is poised to become Europe's largest within three years. GM has an 8.9 percent share and VW 7.5 percent, with both reporting faster sales growth than Lada in the first five months. The Russian carmaker's hopes rest on customers like Sergei Chernikh. The 35-year-old retail manager from Voronezh, about 500km south of Moscow, bypassed Fiat and Chevrolet models to buy a Lada 2107 sedan because it was cheap and easy to maintain. "I chose Lada because of the price mostly," said Chernikh. "I even can do minor repairs myself if needed, which I wouldn't be able to do if I bought a foreign model because of the large amount of electronic gadgets." 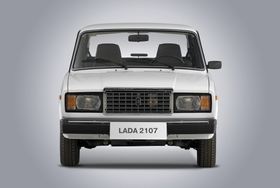 The Lada 2107, one of three so-called classic models, was first introduced in 1982, when Leonid Brezhnev was in power. It starts at 206,900 rubles ($7,300), less than half the price of the Ford Focus and VW Polo. The other Soviet-era Ladas still for sale are the 2104 and 2105, which are the cheapest Ladas and cost as little as 178,000 rubles. The "classics" are the second-best selling model line in the Russian market after the Lada Kalina, which was introduced in 2004 and starts at 281,900 rubles. The newest Lada is the Priora, introduced in 2007 and costing 326,300 rubles. The challenge for Lada will be to keep prices low, while modernizing technology to compete with foreign brands, said Elena Sakhnova, an analyst at VTB capital in Moscow. Price is Lada's most competitive advantage, especially outside Moscow and St. Petersburg, she said. To secure its market lead, the company has also relied on a network of 385 dealers, which is more extensive than anything foreign brands can currently match. In the Voronezh region, which has a population of 2.4 million people, there are nine Lada dealers compared to one Renault shop. "You can find the same situation in any other smaller city in Russia," said Sakhnova. "But the situation is changing and AvtoVAZ will be losing this advantage as Ford, GM, Toyota and others continue to expand." Ford, which has a plant near St. Petersburg, signed a manufacturing and distribution pact this year with OAO Sollers. Volkswagen, which has a new factory in Kaluga, will produce VW and Skoda cars with OAO GAZ, a Russian vehicle manufacturer owned by billionaire Oleg Deripaska. BMW AG is considering a factory in Russia. Fiat, which helped set up AvtoVAZ in the 1960s, also plans local production. Russia may become the largest car market in Europe in 2013 or 2014, outpacing Germany, Ivan Bonchev, the Moscow-based head of Ernst & Young's automotive industry practice for the region. Russia's Ministry of Industry forecasts car sales to climb 73 percent to more than 3.3 million in 2015. To combat the encroachment of foreign carmakers, AvtoVAZ plans to use the underpinnings of the Logan from partner Renault for new models, including a minivan and van. The French carmaker will also help Lada develop a low-price platform to replace the "classic" models, said Oxana Nazarova, a Moscow-based spokeswoman for Renault. The carmaker also has powerful allies. Russian Prime Minister Vladimir Putin drove 2,165km (1,345 miles) in a yellow Lada Kalina Sport to inspect a new road in Russia's far east in late August 2010. He called the car "comfortable and reliable," according to state-owned news agency RIA Novosti. Backed by new Lada models, Renault along with alliance partner Nissan Motor Co. aim to boost the three brands' combined share of the Russian market to 40 percent by 2016, Nazarova said. The group has 35 percent of the market now, according to data from the country's Association of European Businesses. For its part, Lada aims to nearly double sales to about 1 million cars by 2020 from 564,000 last year, AvtoVAZ spokesman Igor Burenkov said. The company is targeting production of 700,000 vehicles in 2011. For all its ambition, Lada almost didn't make it this far. After the dissolution of the Soviet Union in 1991, the car market collapsed. The factory in Togliatti on the Volga river kept functioning at the time by trading finished cars for parts from suppliers or for food and clothing for workers, said Yuri Zektser, a former AvtoVAZ board member. The Lada maker was kept afloat by handouts from the Russian government, with loans from the state rising to about $1 billion by the mid-1990s. Mounting debt and a growing technology gap with the rest of the auto industry prompted the Russian government to seek out a partner. In 2008, Renault beat out GM and Fiat for a 25 percent stake in AvtoVAZ. The Boulogne-Billancourt, France-based carmaker is now in talks to take control of the Russian carmaker. The manufacturer's struggles over the past 20 years are a far cry from its position as the car of choice during the Soviet era. East German buyers had to wait as long as 17 years to get a Lada, which is an old Russian word for "beloved."